On Monday of this week I blogged about my beloved Doctor Who afghan. It got me to thinking about other afghans in my life. Here is the swatch from the one I made for my daughter and son-in-law when they moved into their new house. 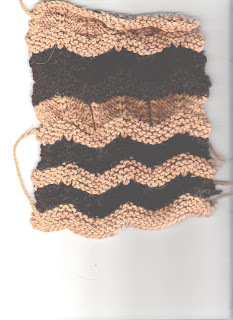 The pattern I used is the bottom stripes of the scanned swatch (above). 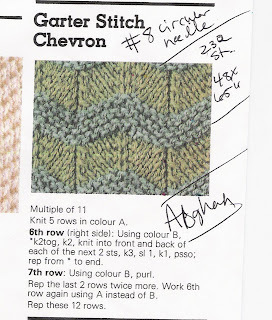 I used the Garter Stitch Chevron pattern from the Harmony Guide. Isn't this a crummy-looking looking scan? You may or may not be able to read my notes indicating that I cast 232 stitches onto a #8 (US) circular needle. I knit the afghan back and forth horizontially over a finished width of 48" and to a finished length of 60". For myself, I would have made a bigger afghan, but my daughter wanted it fairly wide, but not too long. As the swatch scan indicates, the stitch pattern made a lovely sawtooth border for itself, so an edging was not required. The finished afghan is pretty - kind of girly in its wavy pattern, but manly in its coloring. The tan and brown shades of the Lion Brand Wool Ease I used coordinate with the caramel walls and darkish green upholstery in the family room with its big-screen tv. The room is much-used but chilly, so the afghan has come in handy. I used Wool Ease because of its washability, but it worked well for this in general. It is very soft. I love chevron and ripple patterns. I have the Jan Eaton Ripple Patterns book, but what else can you do with ripple paterns besides afghans? I would love to hear some other ideas from you.